Too funny, I was just flipping through this magazine last night! I wish I had all that cute stuff when I was little! Ahh... I'm im love with this stuff.. I have still yet to find anything for my 9 week olds room for decore that would match the madres set i purchased from there.. but that fish moble is def. on my list of things to get. I love everything here! 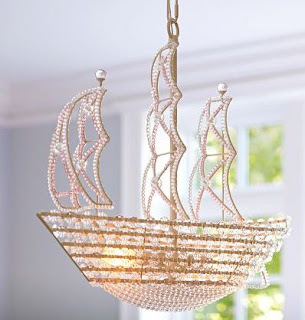 I think a nautical nursery or kids room would be adorable. The fish mobile is INCREDIBLE! That chandelier and the whale family sign are super cute! Love PB.